My Mum died last week. I've never been sadder. These poems are for her funeral. The first I wrote after Mum took me to Ilkley, in Yorkshire, where she grew up, to show me around her memory lanes. The second I have just written and the third is the title poem from my first poetry collection. and full of tales you must recall. the path you took beside the River Wharfe. as they shopped for the rich man’s dining hall. survived the brick new builds. your name, head girl, no longer on the wall. you set off for the family’s first degree. out onto the open moor. Though I was the wicked little one. to seize the day, to plug away. but not that fruitcake, that was her secret. From Mum I learned to keep Mum. few of us will love so long. I hope I’ll be so calm, so brave, so strong. Can walrus ivory teach us about value? I was given polar bear patterned pyjama trousers by my brother this year, and they remind me that some indigenous people in the arctic have traditionally worn polar bear fur pants as an indication of their adulthood and hunting prowess. Although I don't like the idea of anyone hunting polar bears, I respect the rights of indigenous people who have always done so for survival. Polar bear pants have come to symbolise for me the fact that people have beliefs that I may not share, but do respect. Most importantly, polar bear pants are objects that are valuable not in a monetary sense, but due to their meaning to those who wear them. Here's another object like that. This exquisite carving is made of 'morse' or walrus ivory (thanks to the ExploreNorth site for the image). It is a magical object, a weapon with sacred power to the person who made it. I am deeply interested in the way objects can have such value. It makes them non-tradeable, or at least not easily tradeable. You can't buy someone's sacred amulet; mere money can't replace its meaning. Conversely, when the sacred value of an object is forgotten, it can be swapped for any other. It becomes merely a commodity. Most objects in modern western society are like this, and they are inherently unsatisfying. The loss of such values leads to a kind of greed that cannot be satisfied and such greed can be seen everywhere now. It's one of the tragedies of our modern condition. To a modern trader, the value of an object like this walrus carving would be simply that it is rare, and thus worth a lot of money. When Pytheas made his epic journey in 320 BC, walrus were much more widespread in the North Atlantic than they are now. Their population was decimated by unscrupulous over-hunting by Europeans in the eighteenth and nineteenth centuries. Although we don't know how far south they lived or how abundant walrus were in the Iron Age, it is certain that the ivory from their tusks was prized. I believe that the reason Pytheas went so far north was because he was searching for the origin of this beautiful material. What's my rationale? Well, it is reasonable to assume that Pytheas was looking for the northern origins of various materials. Amber and tin are almost certain, and perhaps we can add walrus ivory to that list. Just as Cartheginian control of Galicia made access to tin difficult, and thus Cornwall's supplies became important, it could well be that Phoenician control of North Africa threatened the trade in elephant ivory to the Greek colonies. The Greeks would undoubtedly have known that there were northern sources of an alternative ivory, and I like to think that Pytheas was in hot pursuit when he travelled to Ultima Thule. Whether he was consciously searching for walrus ivory or not, he would almost certainly have come across walrus hunters. I wonder what their hunting rituals were like and how they viewed ivory. My guess is that they would have considered the killing of a walrus to be a profound, ritual event, of great danger to the hunter and resulting in a sacred substance of great mystical power. However, trading along the long and complex routes that led to the Mediterranean could well have diluted that sacred value, so that walrus ivory, or morse, would be reduced to just a carving material exchangeable for similar things, like the tusks of elephants or certain kinds of wood. An ancient Greek would think about a walrus ivory carving in a completely different way from a north Atlantic walrus hunter. And of course, how we respond to an ivory carving today is different again. Tonight’s the longest night. I love knowing that for thousands of years people have celebrated this moment, when we begin our journey back around the sun, back towards another cycle of growth. Tonight’s the night to snuggle down by a fire, look back over one shoulder to review the year and contemplate the next one. I wonder what Pytheas thought of our long dark northern winter nights, back in 320 BC, and how glad he would have been to know that the days were going to lengthen again. Thanks to everyone who has made this such a brilliant year for me. Not least Creative Scotland, whose grant enabled me to take a big chunk of time away from paper campaigning to focus on my novel. And also a huge thanks to everyone who has helped me along the way to becoming a sailor. It’s a wild day today, I’m glad I’m not out at sea on a boat. 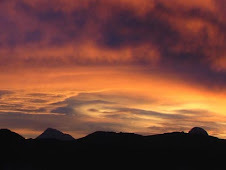 Wishing you all a safe and peaceful solstice. Modern life seems to be increasingly pressured, with ever more to do, at an ever accelerating pace. Even polar bears seem to be suffering from the 'hurry sickness'. According to a recent study, thinning ice drifts faster than it used to, so polar bears must move further and faster each winter to find sufficient food. 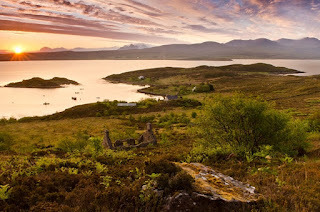 To counter this trend, in early May next year I will be leading a creative writing retreat on the ultimate venue for relaxation: Tanera Mor, in the Summer Isles. To find out more see my website here and to make a booking see here or contact Lizzie on +44 (0)1854 622252 or by email. 1. It is immediately before the Ullapool Book Festival, so you can combine your love of reading and writing in one trip to the Northwest. The Ullapool Book Festival is without doubt the friendliest literary event of the year and always has a brilliant line-up of the best of Scottish writers. 2. 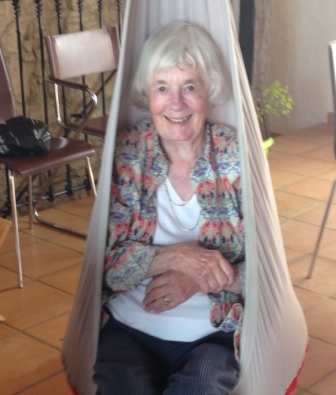 It's cheaper than most other tutored retreats, like Arvon weeks or the retreats at the wonderful Moniack Mhor writing centre. Plus you get six nights instead of five. 3. It's on an island! Once we putter off from the jetty, near Achiltibuie, we really are away from it all, with just seals, eider ducks and the occasional porpoise for company. If you register before the end of January, prices are reduced, so if you're tempted, book now! 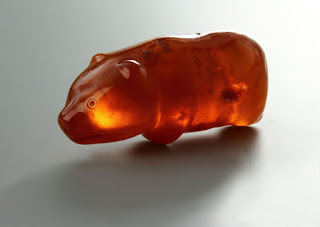 I have an amber bear, a bit like this ancient amulet, which may be as much as 3500 years old. Mine is a relatively new thing, I guess, though I have no real way of knowing. It came from Krakow, Poland. Whenever it was made, the amber itself is millions of years old. It's one of my most precious possessions. My amber bear has made its way into my Iron Age novel. Back in 320 BC, when Pytheas was making his epic journey, amber was viewed as a magical material. It is still believed to have healing powers, but back then it was used in religious ceremonies and rituals because of its extraordinary properties. It appears like a gemstone, yet it is warm to the touch, like plastic, it glows and will melt in a candle flame. When rubbed, it creates static electricity; you can lift cloth with it, and even create sparks. No wonder it seemed to have magical powers to the ancients. Amber is not found in the Mediterranean, so the Greek supply of 'electrum', as they called it, came from northern Europe. In the Bronze and Iron Age it was plentiful on the coast of Jutland, across the North Sea from Britain, and on the shores of the Baltic sea, which is where Pytheas' quest took him. There are many wonderful stories about amber's origins. Some believed it to be the droppings of magical lynxes. Others believed it to be the tears of a goddess who fell in love with a mortal fisherman. The Greek story is that it is the tears of the Heliades, the daughters of the sun god, Helios. When their brother, Phaethom, stole his father's chariot and tried to ride it through the sky, he lost control of the horses and set fire to the firmament. Zeus tossed him down from the heavens into the river Eridanus, where he drowned, and when his sisters came weeping there, they were turned into poplars. Their tears continued to pour, as resin, which solidified into amber. I wonder if Pytheas believed this tale. Was he seeking the river Eridanus, on the banks of which he would find the magical weeping trees of the Heliades? Or was he, as a hard-headed scientist, trying to debunk the old myth and return with a more factual account of gems washing up on the North Sea beaches? Whatever Pytheas believed, he would surely have been amazed to learn the truth, that Baltic amber is up to 50 million years old, and is, genuinely, the 'tears of trees', being fossil resin of ancient (and now extinct) conifers. I like to think he had an amber bear in his pocket, while he pondered its mysteries. 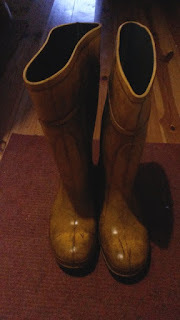 Here are my wellies, standing in solidarity with the shoes in Paris, protesting lack of action on climate change by our government, and expressing my outrage at the bombing of an oil field by UK planes in Syria. I'm also posting these wellies because life would be unbearable without them. It's currently lashing with rain, and the croft paths are all sodden and muddy after what feels like the wettest and windiest year I've ever known. Back in the Iron Age they had no wellies. How did they survive? But seriously, I am almost speechless with rage at the crass cynicism of our prime minister David Cameron, who on Monday asked leaders at the conference of the parties to the UN Climate Change Convention, what they would say to their grandchildren if they fail to tackle climate change. Presumably he was rehearsing his own lines, given that he was right then planning to fly jets to Syria to set an oil field alight, causing who can guess what level of carbon emissions. So here I stand, stamping my feet with fury. Soon I shall go back out into the rain, to scuff about and maybe kick something, think about polar bears, growl a bit and try to find somewhere positive to channel this angry energy. Suggestions welcome.